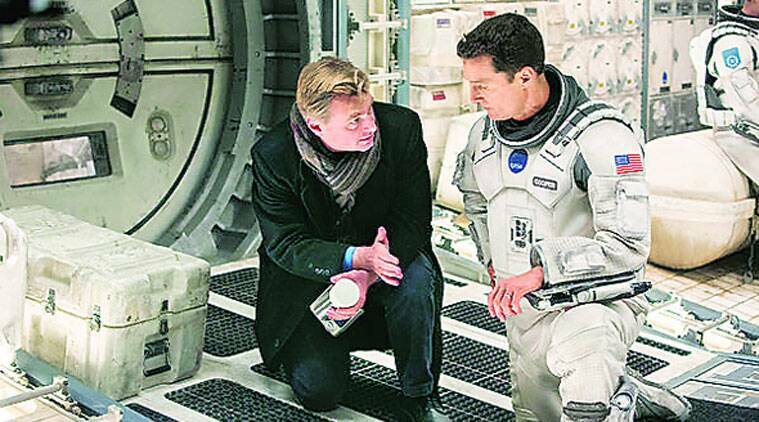 Nolan with Matthew McConaughey on the set of Interstellar. Interstellar was Anne Hathaway’s second Christopher Nolan movie, after The Dark Knight Rises, but it still took her a while to realise what that meant. When the 44-year-old Nolan walked into a hotel suite for an interview, that intensity came across. He is famous for running a tight ship, but that’s understandable given the complex and highly stylised fare in which Nolan specialises. His filmography — much of it co-written by his brother, Jonathan Nolan — includes Batman Begins (2005) and its two sequels, The Dark Knight (2008) and The Dark Knight Rises (2012), which between them have earned almost $2.5 billion at the global box office, but also the indie hit Memento (2000), Insomnia (2002) and the mind-bending Inception (2010), which earned more than $800 million and won four Oscars. His latest movie is typically ambitious: Interstellar, releasing soon, focuses on space travel and the challenges of sustaining human life on other planets, all convincingly rendered at a cost of $165 million. The seed of the story was planted in 2012, Nolan said, when he watched the space shuttle Endeavour being carried through Los Angeles to the California Science Center, ending a journey of 123 million miles. Eventually the Nolan brothers produced a screenplay about Cooper (Matthew McConaughey), an astronaut who travels through an interstellar wormhole in a quest for a new home for humanity, hoping to ensure a future for the family he may never see again. The mission is all the more pressing because, in the near future envisioned by the film, a severe drought has made Earth increasingly uninhabitable, to the degree that Cooper’s children may represent the planet’s final generation. Hathaway plays Brand, Cooper’s second in command, with Jessica Chastain as Murphy, an Earth-based scientist working to facilitate their mission. The cast also includes Casey Affleck, Wes Bentley and Michael Caine. “The inception of this project was talking to my brother, Jonah, who was working on this screenplay originally for Steven Spielberg,” Nolan said. When Spielberg left the project, Nolan readily stepped in. To envision the environmental catastrophe that underlies Interstellar, Nolan reached out to documentarian Ken Burns, whose The Dust Bowl (2012) explored the drought that devastated the American plains in the 1920s and 1930s. Viewers shouldn’t expect a heavy-handed political message about climate change, however. They also shouldn’t expect a film that is nothing but intergalactic starscapes. The most pivotal scene for him, the director said, was one in which Cooper, on the other side of the wormhole, gets several video messages from his kids back home and begins to sob. “Let me tell you that there were a lot of manly men watching the dailies in tears,” he added. A native of London, Nolan has been making movies since he was 7. His first theatrical feature, a noir thriller called Following (1998), cost only $6,000 to make, but nowadays he’s thought of as a maker of blockbusters. Besides the Batman movies, he also produced Man of Steel (2013) and is producing Batman v Superman: Dawn of Justice, due out in 2016. Nonetheless the filmmaker — who lives in Los Angeles with his wife, British producer Emma Thomas, and their four children — doesn’t think of his work in those terms. As to the next story that will grab and hold him, don’t ask.